Bubble nest is slowly falling apart. Male is super busy chasing after runaway fry and returning them back to the nest. Pretty sure I may have to start feeding them tomorrow and I'm really nervous as I've heard it's quite easy to overfeed the fry which can kill them either by water pollution or just them eating too much. Bbs had a really good hatching rate, nearly all of them hatched and all in just a tub of salty water by the windowsill. As of yesterday the fry are free swimming, male removed this morning for a well deserved rest. There is a ton of plants in the tub and I just added water lettuce from my shrimp tank. The fry should have enough of microorganisms to get them going. I saw some white little dots moving around on the walls. I will start small water changes today, just to replace water after cleaning the bottom of the tub. I saw one fry on the bottom, not sure if dead or just resting, will confirm after the maintenance. It's quite overwhelming to thing that the easy part is over and now the babies rely on me but honestly I could not be happier. Fry are eating vinegar eel and I only lost one that I could see. They do not seem to be getting any bigger but that may be due to my constantly watching them and probably why I can't see any difference? I added water wisteria to the grow out tank a week ago and now it's overrun by millions of tiny snails...could anyone recommend a snail killer snail that will not leave milion eggs all over the tank? Also, can fry eat cyclops? 6 of the fry are now dead. One on first day, two the next, three today. Awesome. I blame it on overfeeding as there was many microworms on the bottom of the tub. One of the coffee filters had a hole and I lost a lot of vinegar eels, hope I have enough to feed the fry that still keeps close to the surface. I'll try to feed less but more often. I'm pretty sure I'll kill this first spawn with the lack of experience. Never had to feed fry that could only eat live foods and could not stand water changes. Than again, some people had luck with egg yolk, I may try that. I guess I was to hasty with microworms but so many of the fry now stays at the bottom searching for food. I also sucked up quite a few fry while cleaning the tub so those will probably turn up dead tomorrow. P.S. some of the dead fry were deformed so it can't all be me. Found five dead fry today and I also noticed something. Some of the dead fry are sort of swollen, bigger than other dead fry and white, does that mean anything to anybody? Anyways, fry are now 5days since free swimming and some people had moved on to bbs by now and I still have fry barely big enough for microworms. I feel like at this rate I would be lucky to be left with any fry and, as a bonus, I am not gaining any experience because I don't even know what I'm doing wrong. Am I overfeeding, am I not feeding enough. Is there a problem with water changes or some disease. I've no clue! Anyways, I have asked few questions on here and was left without a answers, I can only assume noone really reads this. You're asking at the wrong area. Do you have any photos of your fry? Here is photo of the fry, there weren't 5dead just 3, two must've been sleeping or something. 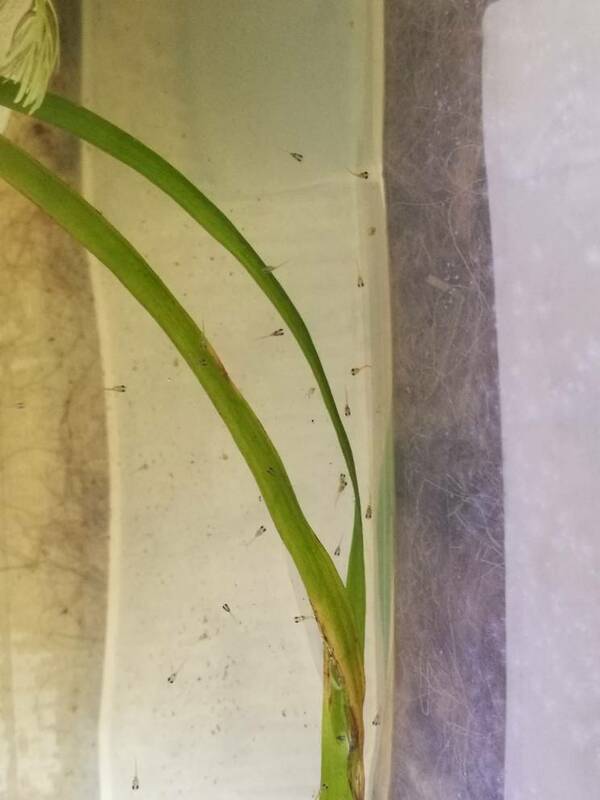 Raising fry isnt easy, first of all they look very young still, did you breed them in a big tank? Because if you did, you cannot target feed them or they cant find food, I fed Microworms for 2days then went straight for Baby brine shrimps till about 4 weeks old then got them off it and went for live blackworms. Your photo only shows me a top view of the dry, but doesn't tell me anything else. I bred them in a 40litre tub filled with no more than 10 litres of water. It's shallow but has a rather large footprint and the fry is scattered all over. I thought water will be easier to keep clean that way. And You're right, it's not easy to distribute the food to everybody. No dead fry this morning so that's a good news. Fry are eating bbs without any problems. I'm an idiot for not trying sooner.